In the early 90’s I received as gifts both a Formula 1 Series Chronograph black dial in steel and an S/el Series grey dial in steel (still own both of them). 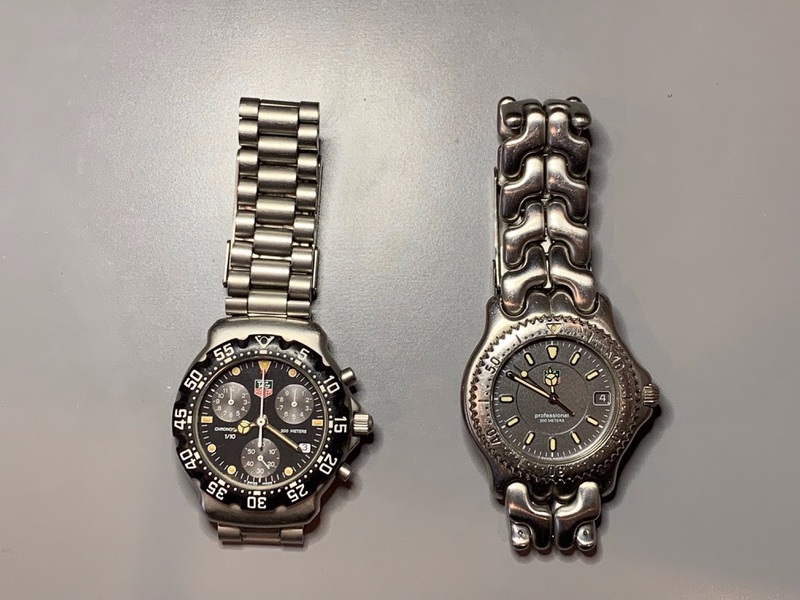 These were my first real watches (albeit both with quartz movements) besides the multitude of Swatches I might have accidentallly destroyed during my childhood. These two watches which I researched in magazine ads and catalogs before the age of the internet and hand picked hoping I would be able to get one of the two, were the start of my horological insanity and led to a barrage of mechanical and complicated timepieces which I have owned through out the years. Many years later when I was finally able to afford to purchase my own timepieces, I passionately followed Jean Claude Biver’s rise in the industry and luckily own a few of the models he introduced of different brands. 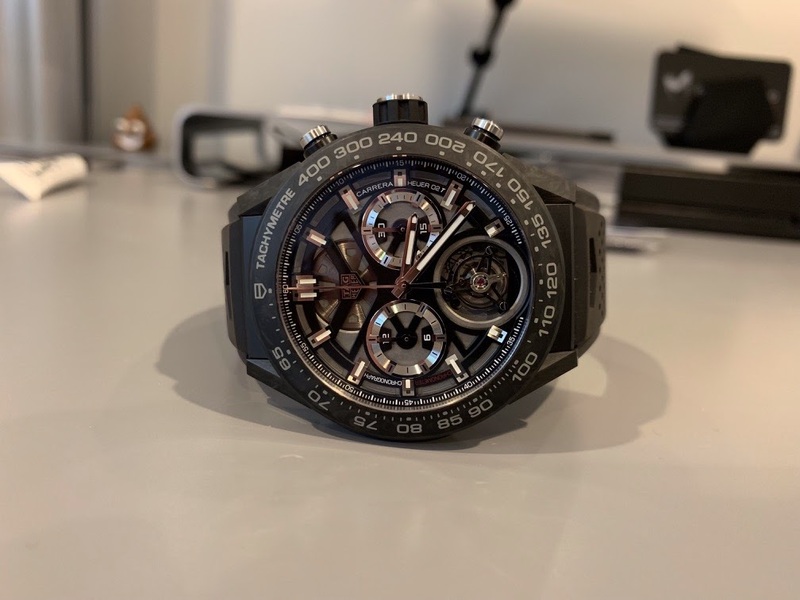 As JCB sky rocketed through LVMH’s watchmaking division and took over the reigns at TAG Heuer I watched closely as he launched the incredible Carrera Heuer 01 amongst many other fantastic changes he made to the company. But my curiosity really peaked when JCB announced a couple of years ago an in-house Tourbillon Automatic Chronograph for under CHF 20,000. First I thought it was impossible and he had either lost his mind or was launching a machiavelic marketing campaign on scale never seen before. After seeing the first examples of the Carrera Heuer 02 T in the wild, I knew it was the later. I tried unsuccessfully for a while to obtain one of these coveted and limited production timepieces and then the Forged Carbon (CMC) version was launched and I went nuts, I had to have that watch. 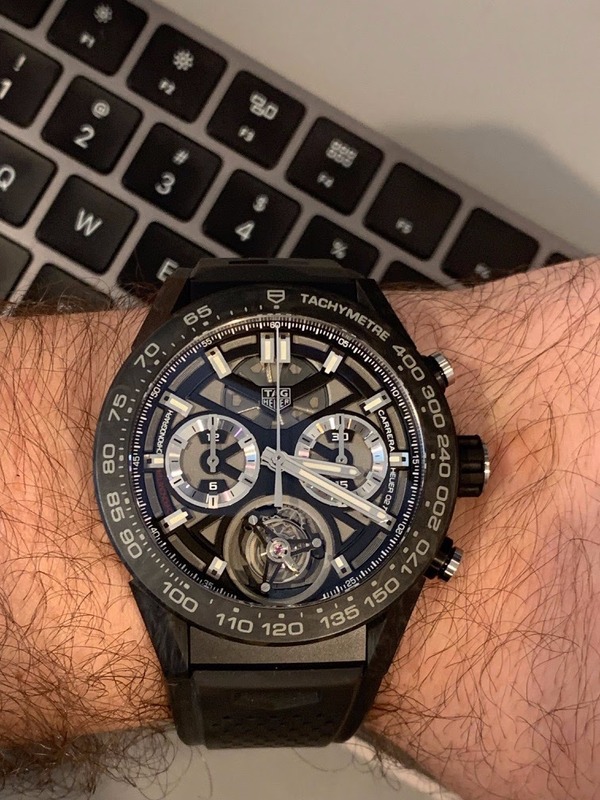 Luckily and thanks to my good friend Georges in Crans-Montana, CH, I was able to get one over the holidays and I am finally back to wearing a TAG Heuer after a much overdue period. Now I just have to stop staring at the Tourbillon all day and get stuff done!!! It really is ridiculously light for a 45mm watch, it actually weighs in at 116g; just for comparison my Hublot KP All Black UNICO Chronograph in all ceramic weighs in at 163g which is fairly light for a 48mm watch. This watch on my wish list when I hear Mr JCB want to release a few years back. But I cannot part 20-30k fr a watch. I settle for a Chinese touby soon. Nice shot!